Anna Urban, Co-Founder of hair supplements brand Aviva on hair growth. So Anna, is everyone’s hair growth cycle the same, regardless of texture? Every hair goes through the same growth cycle regardless of texture and on average grows of about half an inch each month or 1.25 centimeters. All three phases Anagen, Catagen and Telogen occur simultaneously; one strand of hair may be in the anagen phase, while another is in the telogen phase. At any given time, as much as 90% of the hair on your head is in the growth phase. That leaves about 10% of your strands in what’s called the “resting” phase. Can you break down what the characteristics of each stage of the hair growth cycle are? At any given time, up to 80%-90% of hair is in this phase – which is why it’s so important to nourish the hair follicle during Anagen. At this time hair fibers are created through the production of protein and keratin. Hair follicles begin to emerge from pores, while oil is produced by sebaceous glands to protect and condition hair. Up to 1%-2% of hair is in this phase right now. During Catagen, the hair follicle shrinks, a part of it is destroyed, and the dermal papilla (which nourishes the follicle) breaks away to rest and rejuvenate-if it has the proper help. Catagen can last anywhere from 2-3 weeks. 10%-14% of hair is in this phase at any given time. During Telogen, hairs do not to grow, as their dermal papilla is in a resting period. Hair remains in the follicles for about three months, and is gradually shed during exogen, which is part of the Telogen phase. Telogen can last anywhere from 3-4 months. Anna, is there any way to extend the growth cycle of our hair? Try adding a nutritional supplement that is high in complex B vitamins and folic acid to work with every phase of the hair growth cycle. Specially formulated supplements for hair like, Aviva Hair Revitalizer, contain biotin (also known as vitamin H, for “hair”)-a part of the B-complex group, which increase circulation to the scalp, thereby promoting hair growth. It is best to take a supplement that has a synergetic complex that also supports follicle nutrition. Helping to support your follicles with the nutrition they need, can often transform even the most lifeless strands into a fuller, more beautiful head of hair. What helps us retain more of our new hair growth if we seek more hair length? An average woman sheds about 100 hairs a day as part of the natural hair growth cycle of rest, growth and shedding. With a well balanced diet of proteins, amino acids and B vitamins and with the follicle support from specially formulated hair supplements, it is possible to prolong the growth phase while slowing down the resting and shedding, making your hair thicker, stronger and more lush. What types of products should we avoid? Products containing Phthalates, commonly found in many beauty products like especially nail polishes and hair sprays. They have been studied by the FDA for their safety. The findings are insignificant, but just to be on the safe side, best to look for phthalate-free products. 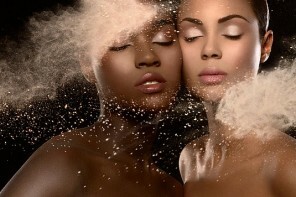 On hot summer or humid spring days, use a dry shampoo after you blow dry. The ingredients will help to absorb moisture and oil all day long, so your style will stay fresh. I love using it as a styling product when applying to fresh, clean hair to add texture. Gently spray on from roots to tips to maintain uniform texture throughout the hair. Then style away. It works on any hair type and length, but girls with thin or oily hair will notice a dramatic difference. 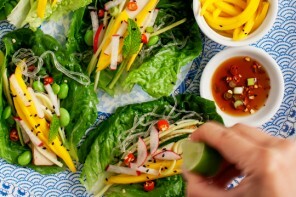 foodie: mango + zucchini lettuce wraps..